Purchases have become society’s number one value. A person feels more confident by buying something that’s pleasant to his ego. This way he acquires confidence in life. However, as we develop, we aspire to a more universal fulfillment rather than a temporary one..
Kabbalah is the wisdom of reception, fulfillment. Absolute fulfillment can be attained only by constant renewal. This is possible if we are united and fulfill one another. The fulfillment is felt as being unlimited—the sensation of an eternal world instead of #BlackFriday. A corrected system of relationships requires people with an integral upbringing. Black Friday: 90% of manufactured products are unnecessary. But the production can’t be stopped since there is nothing else to occupy the people with and producers can’t work without economic stimulus. The world would stop. There is wisdom that accumulates with life experience in this world. We explore this world and naturally develop the tools given to us from birth. Over years and from generation to generation, our minds and hearts expand, and this is how we advance in our understanding of the world through the five senses. However, the spiritual world requires new and completely different perception organs. Firstly, we need to acquire them, because initially we do not have them. Also, in the spiritual state we are obliged to combine two opposites in ourselves: while remaining a created being, we should become similar to the Creator. These are, however, two polar opposite forms that cancel each other. One can be either a created being or a Creator. They are two different realities. That we are created beings but have to accept the Creator’s form while remaining in our world and state is very complicated. It requires a major change in our structure and perception. If in our world we are guided by our mind and feelings that support each other, then in the spiritual world it is the opposite, one contradicts the other. There might be a bad feeling in a good state because we reveal the reality above our egoism. Therefore, inside egoism, we can feel terrible, but in fact, this is the best state. Perhaps we do not understand what is happening to us without having any spiritual insight, and this will be the highest state. This is why it is difficult to perceive and establish one’s state in the spiritual reality. Therefore, it is said that in the spiritual world, two opposites are united in one object, and faith operates above reason. It requires great stamina, attention, and time. Gradually “habit becomes second nature” because we let the upper light work on us time after time, patiently agreeing with everything it does to us. Our mind cannot combine the two lines: left and right. How can there be peace and harmony in a person who would very much like to become rich, but upon finding himself in total poverty agrees with his condition in the middle line, thereby uniting the left and the right? How can two such opposites fit together? How can it be that the more a person learns, the more he understands and feels? Every time he reveals his ignorance, stupidity, and lack of success more and more, but at the same time rejoices and reconciles these two states in himself. 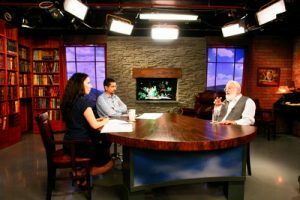 How is it possible that having invested 10, 15, or 20 years into the spiritual path, a person receives nothing and is happy about it? He reveals that it is just wonderful that, with his great desire, he did not receive any compensation for his egoism. He feels perfection in the existence of two such opposites. A Struggle Between Opposites Or Harmony Between Them? 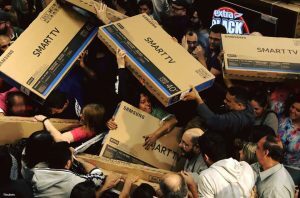 Black Friday, the world shopping craze, points to a more fundamental phenomenon than the purchase of a cheap television screen: the impact of the environment on man. Even someone who is not a compulsive consumer is drawn to the hedonistic pleasure of searching and purchasing products on sale. The satisfaction of buying gives us a feeling of renewal and joy that justifies every penny. In retrospect, when the monthly charge is sent, we are suddenly aware that most of the purchases were not derived from a real need, but from a social-competitive need that was in the air at the time and swept us up in the heat of the moment. In general, our desire for shopping is diminishing.There is also an explanation for this: The purpose of the manufacturers and shop owners is to encourage us to consume more and more in order to move the wheels of the economy, the chain of production and sale. Simply put: when we buy, business revenues grow, as a result they pay more taxes to the state and can employ more workers. So more people have a salary and they can, not surprisingly, buy more. This circle explains why about 70% of US GDP comes from private consumption. However, it is no secret that the recovery in private consumption and consequent economic growth is weak and disappointing, especially given the unprecedented incentives and zero interest rates since the 2008 crisis. Not only has the traditional economic toolbox failed to significantly boost the economy, there are other factors adding oil to the fire. The aging of the population, high technological unemployment and a lack of understanding of the behavior of the millennial generation all necessitate the need for a significant change in the system. So, there’s no problem with shopping. It makes people happy to enjoy these shopping holidays, because by doing so they learn how much general participation in the environment, even if virtual, provides them with strength and joy. Hopefully such joint actions will make us recognize the need to strengthen our relations. If this is the result, we can say that we harnessed consumer culture to serve man, rather than vice versa. Question: Can one understand the language of the higher system and begin to speak the same language? Answer: To the extent that we comprehend the program of the upper management, we can be included in it. At each stage, for every ten Sefirot, we are given access, the inclusion code. And so, gradually, by being included in the upper management, receiving signals from it and giving signals, we become its integral part and an active element of this system. What Is Revealed In The Process Of Attainment?